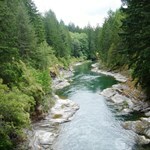 Drift down the Cowichan river stopping at all the great fishing holes to cast your line. Suitable for gear or fly fishing anglers. The Cowichan river is slightly wider than many of ... morethe canyon rivers of Vancouver Island making it a perfect river to throw some flies. We use a NSR raft to get right into the best spots that are inaccesible to larger boats and hikers. We only take 2 anglers at a time, so pressure is minimal and you get to fish every nook and cranny of the best holding spots. In the fall Cowichan River drifts we can catch Salmon. In the winter we have one of the best steelhead winter runs from the pacific ocean. Later in the season the brown trout begin to come alive and give an exciting fight. For the adventurous angler who enjoys the peace and tranquility of uncrowded river! 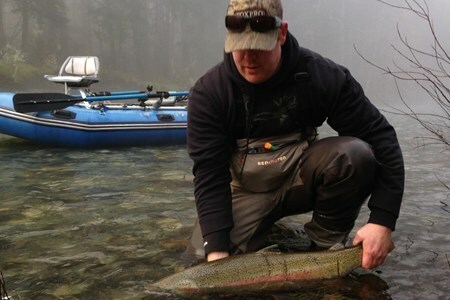 Great winter run steelhead opportunities here with some great holding spots. Good rain gear and ... morequality waders are essential for our climate and water conditions. Lake Cowichan, British Columbia is a great place for a fly fishing trip. 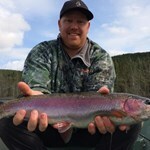 With plenty of guided fishing trips to choose from, it’s easy to plan your Lake Cowichan, British Columbia fly fishing vacation. Close proximity to excellent fly fishing rivers and an abundance of knowledgeable fishing guides make Lake Cowichan, British Columbia one of the top fly fishing destinations. Explore Lake Cowichan, British Columbia to find a variety of fly fishing outfitters, guided trips and fly fishing vacation packages. 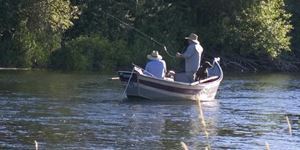 Find current conditions with Lake Cowichan, British Columbia fishing reports and discover the top access sites for fly fishing. Get in on the trout action with Yobi Adventures.